The Chicago Cubs tradition is one built on spectacular losing streaks and even more spectacular collapses. Yet despite all the losses and disappointments, an amazing thing happens every summer at the corner of Addison and Sheffield: millions of fans flock to Wrigley Field and millions more fans across the country regularly tune in to watch Cubs games broadcast on television. Exactly why Cubs fans support their squad with such reckless abandon isn’t entirely clear—these people represent a remarkable aberration of human psychology, epitomizing the spirit and experience of dedication to a desperate cause. And the whole time, they’re oddly happy. The Cubs Fan’s Guide to Happiness reveals what makes Cubs fans tick and what keeps them happy. It explains why it’s not over until you’re mathematically eliminated, why winning really isn’t everything, and why it’s perfectly acceptable to blame all your trouble on a scapegoat—which may or may not be an actual goat. 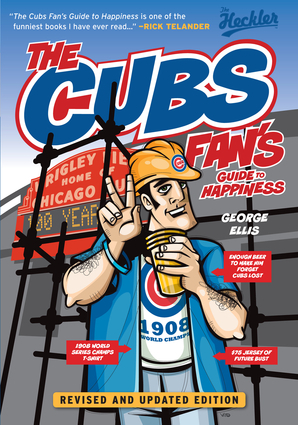 The fully revised edition also provides educational sidebars, practical applications, and true words of wisdom from celebrity Cubs fans as well as surviving the planned renovations to the product on the field and Wrigley Field itself. George Ellis is the cofounder of the Heckler, a satirical Chicago sports publication. Originally focused on the Cubs, the Heckler expanded to cover all Chicago sports in 2006. He lives in Austin, Texas. Chicago Cubs fans are another breed. They are a portion of the population who continue to negate all logic year-after-year by supporting their Cubbies no matter if they are five outs away from the World Series (and blow it) or if they are 21 games under .500. Their concept of reality is somewhat distorted. Despite the embarrassing seasons Cubs fans have tolerated throughout the years, somehow fans are still able to achieve this sense of happiness, good fortune, pleasure, contentment, joy, and complete and utter bliss. How does one achieve this state of being given the Cubs erratic history? The Cubs Fan’s Guide to Happiness isn’t just for Cubs fans. It provides readers with educational sidebars, practical applications, quizzes and true words of wisdom from celebrity Cubs fans. It explains how fans are used to being let down and why they are able to handle it far better than most. A lesson everyone can benefit from.